NP-40 is a rather high capacity battery and should last for almost twice the number of shots NP-20 would in smaller cameras. However, if you are going on a vacation with a possibility of being a few days without power - you may consider bringing an extra battery and some extra memory with you just in case. 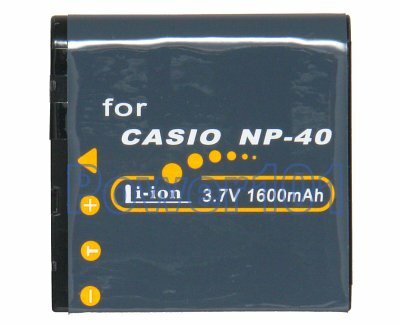 This battery is compatible with many slim Casio Exilim cameras that use Casio NP-40 battery. Most common cameras using this battery are: EX-Z30 EX-Z40 EX-Z50 EX-Z55 EX-Z65 EX-Z600 EX-Z700 EX-P505 EX-P600 EX-P700 Please check your camera with our camera battery finder. 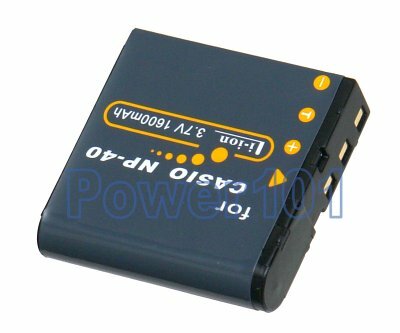 This battery can be charged with any charger compatible with Casio NP-40 batteries. Such as the charger that comes with your camera.